Location: Essex Junction, Vermont, U.S.A. This project captures methane gas and uses it to fuel two 30 kW electricity-generating turbines. 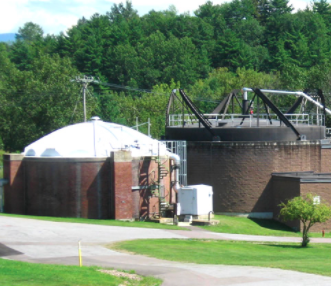 The methane is produced through the anaerobic digestion of municipal sewage sludge. Previously, the methane gas was burned to avoid the release of methane into the atmosphere and to provide necessary heat to the digesters. Now, the project uses all of the methane to generate approximately 350,000 kWh of electricity per year, which powers pumps, grinders, and other processing equipment. It also captures the heat produced when the methane is burned for the turbines and uses it to warm the digester tanks. As a result, the same methane provides two benefits – electricity and heat. All of the electricity that the turbines generate would otherwise have been drawn from the grid. By producing this electricity, the project reduces the total amount of electricity that would have been generated by burning fossil fuels. This project is a collaborative effort between the Village of Essex Junction and NativeEnergy. We quantified the emissions reductions from this project following the Climate Neutral Network protocol. The project’s electricity production is third-party verified bi-annually. This project meets NativeEnergy’s stringent additionality criteria, as our funding was necessary to the project’s implementation.